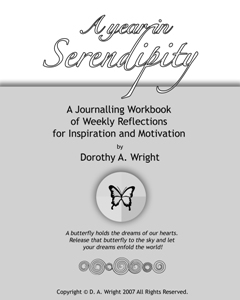 The reflections in “A Year in Serendipity”-for some - may become affirmations to help in heightening your intuition, self-knowledge, and awareness. For others, they can be used to develop their visualization abilities. For still others, this book may support them in dealing with life crises, such as a job loss, the loss of a loved one, or a chronic or serious illness, and foster the beginning process of inner healing. For each person who reads them, these reflections will mean something different and will be applied in a different way, simply because the pathway to Serendipity is unique for everyone. As you read each reflection, you may develop a way of knowing--a way of recognizing the very many possibilities in your life that you have never contemplated before. These reflections can be relevant for both mindful and guided meditations-- some with a specific focus, possibly to make a change, to generate ideas, and so forth. May this book tap into your natural talents and guide you in visualizing your goals. May it motivate you to achieve them so you can find your own personal path and be true to your inner self. Buy the Book: For Cdn $25 (including shipping), Dorothy Wright will send you signed copy of the book to you. "Dorothy, I received the book this evening. Wow!!! What an inspirational book...it's certainly authentic and something that will lift one's spirit. Two of my favorites are "The Genius of Adversity" and "Prayer". Those touched me very deeply, and I concur with you that "Out of adversity comes strength, persistence, determination...". A book that's well worth reading."